The world’s largest surfing lagoon is scheduled to open in 2020 in Turtle island, Siheung in the Gyeonggi province of South Korea. 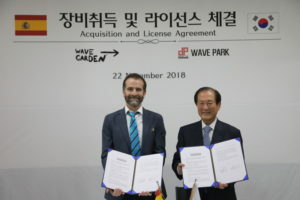 Last year on November, Wavegarden and Daewon Plus Construction, South Korea’s real estate and theme park developers, have signed a contract formalizing their partnership to develop this project. 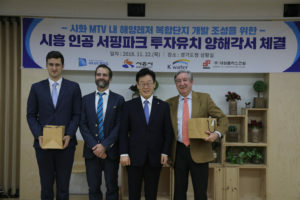 This day, the Governor of the Province, Siheung’s City Mayor, Ambassador of Spain, Economic and Commercial Counsellor of the Embassy of Spain and the Secretary General of the Spanish Chamber of Commerce in Korea have also attended the ceremony. This major project is expected to create Turtle island as Korea’s premier surfing and water activity destination and a must-visit site. Turtle island will have different water and lanside leisure facilities including hotels, convention centers and marinas. The Wavegarden Cove surfing lagoon will be specially designed to provide ideal conditions for everyone including professionals and amateurs, offering different sizes and power of waves. Visitors will also be able to enjoy other aquatic activities including kayaking, SUP and swimming in zones with and without waves. Despite the challenges of developing a project of this magnitude, Wavegarden has had years of experience to apply their technological solutions to build a lagoon of this scale. In addition, the state-of-art-machinery will not only be able to create millions of waves per year but at the same keep the water transparent and clean and acquire the highest level of energy efficiency available nowadays for large recreational water bodies.